Hang this creative display from door knobs, drawer handles, and wall hooks for a unique jewelry arrangement! 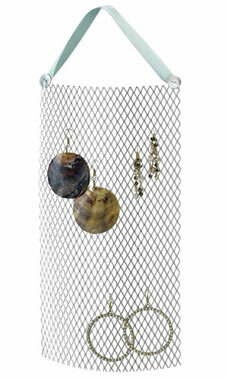 Our wire honey comb hanging display is 12” tall and looks great with an array of earrings attached. The satin ribbon holds the panel in place on any hook but the curve of the screen will allow this item to stand on its own on any table or counter for a quick convenient shopping experience.